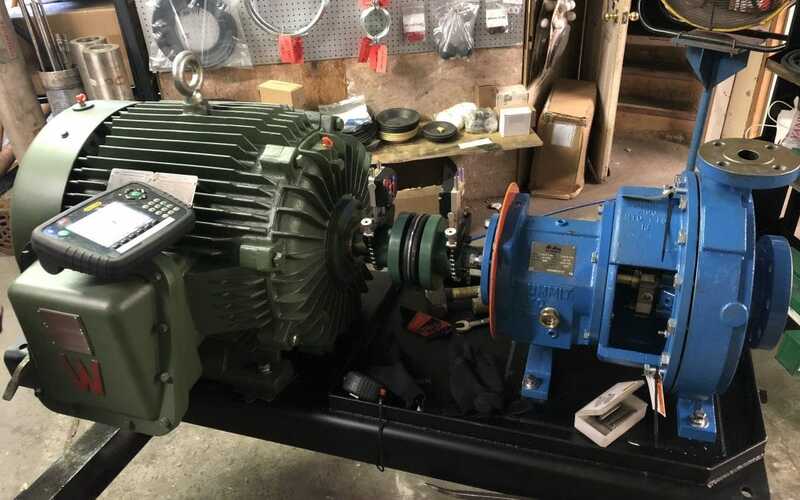 A precision laser alignment is being performed on a NEW Summit 2196LF LTO 1.5×3-13 ANSI End Suction Centrifugal Pump coupled to a 100HP Worldwide Electric Explosion-Proof Motor. This crude oil “charge” pump (and motor) is mounted to a custom steel baseplate that includes a drip rim designed to prevent any environmental hazards or spills, in the event of a sealing failure. This charge pump is intended to raise the fluid pressure high enough to overcome the required NPSH before the fluid enters into the main pumping system.